"Perception Is Not Always Reality"
Then at the reunion, we got to hear first-hand from Troyzan about how he is the second coming of Richard Hatch. Keep in mind that Troyzan (while he did play hard and was decent in the challenges) was chiefly memorable in the social/strategic realm for going out of his way to antagonize the people not in his alliance, while assembling for himself a solid alliance consisting of: Jonas. Who would have have beat Troyzan in the jury vote, since everyone loved Jonas. So the Richard Hatch self-comparison seems a bit strained, since Hatch didn't feel compelled to win every immunity challenge (and indeed, famously dropped out of the final one), because he was actually in control of the game, and able to convince people (who had never watched the show) to do the things he needed them to do in order to win. But apart from that, and pretty much any other category you could come up with, they're twins. Of which Troyzan is clearly the superior member, just ask him. Honestly, if the casting this season was designed to make the viewing audience yearn for a season with zero applicants, they did a bang-up job: There was repeat applicant Troyzan, Sears contest applicant Christina (who apparently decided to stop playing after day 1), and Colton, whose foul, over-rehearsed comments made him unwatchable. Way to go, casting. We really hope Kim applied, to balance this out. Kourtney was one of the more interesting characters going into Survivor: One World, and when she was removed in the first episode with a broken wrist, it was disappointing. Made all the worse by her minimal screen time in that episode. And the lack of a title sequence in the premiere. So it was some consolation that the return of the Fallen Comrades segment (and the title sequence) gave her a bit more time on the show during the finale. Only to have it yanked away again during the reunion, where Jeff Probst felt compelled to scout out random people in the audience who liked Colton, so he could talk to them, rather than talk to Kourtney (or Nina, who got much the same short shrift at the reunion, but at least had a decent boot episode). You would think that the Survivor: Philippines twist of giving medically evacuated players a second shot would provide an easy segue to find out how Kourtney's wrist had healed up. Or about how her cancer treatment has progressed. But no. Not when there are future horrendous returning player casting decisions for which to belaboredly provide cover. Rather than throw out subjective opinions here, let's turn to the numbers: Kim Spradlin is the winningest female Survivor challenge performer, ever. And she used this final episode to put an emphatic explanation point on that sentence (which we seem to have misplaced, sorry). Keep in mind: she didn't need to win the final five immunity challenge, because she already had a hidden immunity idol* that expired at that tribal council. Which she got to keep, because she won traditional immunity, anyway. Her second win at the final four immunity challenge put her in some elite company: second-most individual IC wins (four), behind only Tom Westman, Survivor: Palau winner, who had five. And they were a variety of different types of challenges: the slip-and-slide challenge from Episode 11, the endurance rope-hang from Episode 12, and these two, which were completely new challenges. An all-around impressive performance, and a well-earned Beasty trophy. *For those of you keeping score at home, that makes two utterly useless hidden idols this season (Kim's and Colton's), plus with the one Troyzan burned unnecessarily. 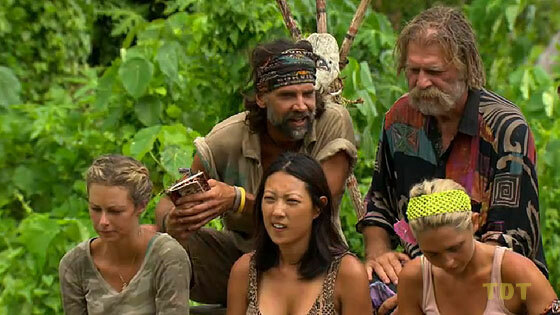 Great twist, which gets to stick around because it was slightly less pointless than Redemption Island. From a purely strategic perspective, Kim's performance this season was an extended clinic in how to play Survivor correctly. Most importantly, as she stated early on, she created for herself several "options." At the final five tribal council, she had a choice between a double-goat final three (Alicia and Christina), or a strong/loyal alliance version (Sabrina and Chelsea). At the merge, she could have gone with original Salani, new Salani, or some new combination. All of this was possible because she was friendly with everyone, through her own tireless efforts. It wasn't a matter of making "fake alliances" with everyone, intending to honor only one. It was more that she really did appreciate what each person/combination of people had to offer, and could see multiple possible paths to the end, only one of which ended up being the one she chose. The likes of Colton, Troyzan, and Russell Hantz would do well to study exactly how she did this. Not that they will, of course. And of course, it didn't hurt that she had a hidden idol to spare, and kept winning individual immunities at the end. But best of all, she put an emphatic (also empathic) end to the belief that strategic players can no longer win, due to bitter juries. She won, 7-2-0. Kim did almost everything right, and as far back as Episode 8, it was so obvious that she was head-and-shoulders above the remainder of the field, that the endgame almost felt a bit anticlimactic (apart from the terrifying prospect that the editing was setting her up for a fall, since it seemed so obvious she was in control). But win she did, and deservedly so. And in doing so, she put in either the fifth-best or third-best overall performance, ever, depending on how you calculate it. Luckily she got both the million and the fan favorite prizes, because really, a season-long Slitty Award seems pretty inconsequential by comparison. Gordon Holmes at XfinityTV.com: "Kim for the Win?" Dalton Ross at EW.com: "The Right Person Won"
Andy Dehnart at RealityBlurred.com: "Kim dominated drawn-out Survivor: One World finale that came alive during the reunion"
Jill Mader at CouchtimeWithJill.com: "And the winner is..."
Stephen Fishbach at People.com: "Survivor Winner's Final Tribal Council One of Show's Best Ever"
Dalton Ross at EW.com: "Survivor: Philippines: Jeff Probst explains the big twist for next season"
Andy Dehnart at RealityBlurred.com: "Survivor: Philippines confirmed but preview doesn't name Jonathan Penner, Michael Skupin, Russell Swan"
Lindsay Silberman at TVGuide.com: "Survivor: One World Winner Kim Spradlin Explains Why She Thought She Didn't Have a Chance"
Josh Wigler at MTV.com: "Survivor: One World Winner: 'I Got Lucky'"
Rob Cesternino at RobHasAPodcast: "Julie Berry Kicks off Your Survivor: One World Finale Weekend"
SuperJude & Tim Lamaster at SurvivorSuperfanCast.com: "Kat Podcast"
Rob & Nicole Cesternino at RobHasAPodcast: "The Survivor: One World LIVE Finale and Reunion Show Recap"